Treble Charger was much better compared to the other two, though still nothing special. Then came the Tea Party. This was one of the most amazing shows I’ve ever seen, period. Jeff Martin walks out, rips into some guitar riff, and the band kicked into The River, and never looked back. Martin appeared to be having a ball up on stage, and he sounded incredible. They played all the favorites, including Fire In The Head, Sister Awake (Heroes insert) Heaven Coming Down and Psychopomp. Jeff brought out a double guitar for Walking Wounded… Then for the encore, they played Save Me (Hurt insert) and closed with the best take on Temptation I’ve ever heard! The band just could not have sounded better! 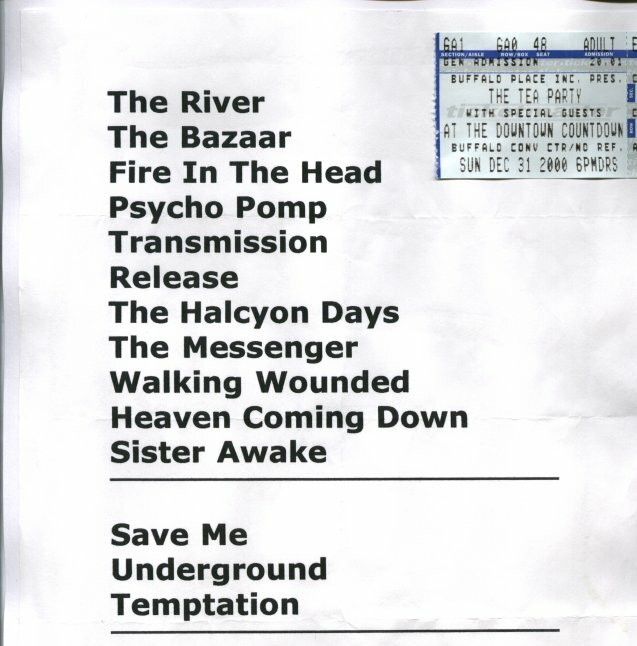 Mary managed to get a copy of the Tea Party’s setlist as well! I’ve had this bootleg forever, but someone else posted it to youtube, so here’s the whole Tea Party set in all it’s glory!